La Orotava is a fascinating town in the mountains of the north of Tenerife. It is noted for its historic buildings such as the House of Balconies. La Orotava is unique and definitely worth a visit or several. There is so much to see there and so many unexpected treasures hidden away in its atmospheric cobbled streets and historic buildings. La Orotava is a town in the volcanic hills above Puerto de la Cruz in the north of Tenerife and its location has in many ways been a safeguard against the modernisation that has happened to resorts on the coast. Stepping into La Orotava is like stepping back in time when you see the Canarian architecture from an era past and the cobblestone streets and alleys where ivy hangs over walls. If you are wondering how to get to La Orotava many people enjoy exploring Tenerife by bus and there are regular services from the resort of Puerto de la Cruz on the coast below. Bono bus tickets are well worth getting too because they save up to 50% discount for bus journeys in Tenerife. You can buy them at bus stations and at selected shops and kiosks. On the way into La Orotava the road passes a fountain on which there is a statue of the Guanche Princesa Dácil who surveys the valley below as the spray of water helps keep the lawn lush and green whilst providing a place where blackbirds hunt for juicy worms. Princesa Dácil was the daughter of Guanche mencey Bencomo, King of Taoro - who was a bitter enemy of the Spanish invaders. However, all is fair in love and war it is said, and the princess fell in love and married one of the conquistadors, by name of Captain Fernán García del Castillo. 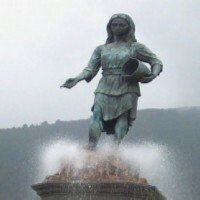 But that's all long ago, and today to my mind, when I look at her statue, she is symbolic of the fertility of the northern mountains and valleys and a connection with Tenerife's pagan past. La Orotava is a place where creepers creep so well and the abundant vegetation of parks and gardens give it a very exotic look, especially with the many large Dragon Trees that add their mysterious charm. Making my way uphill from the bus station one of the first sights I saw was a magnificent display of purple-blossomed Morning Glory (Ipomoea acuminata) rambling over a bank by a car park. I headed over to the west side of the town to see what I could discover and to have a look at the famous Casa de los Balcones with its inner courtyard in which tall palms grow, strange Staghorn ferns (Platycerium holtummii) hang in baskets, and ornate balconies look down on it all. Casa de los Balcones is one of several historic buildings in the Calle San Francisco, which connects the pretty squares of Plaza Casañas and Plaza San Francisco. In it you can buy local Canarian food and drink, the best wines, and arts and crafts. There is a museum called the Museo de las Alfombras, in which for just one Euro, you can find out all about how they make the amazing floral carpets that are laid each year for the celebration of Corpus Christi. In the Casa Lercaro where there is a restaurant, there was an old-fashioned waterwheel and Spanish Colonial style terraces and gardens. I had a look in the lily pool but the only sign of life was a lonely Pondskater (Gerris thoracicus). But there's plenty to see and to buy in La Orotava although I was wondering what wildlife lived there and then I happened upon a few real surprises. I was wandering on down the street when I spied what I first thought was a gecko on the grey steps of a building. I looked again and saw it was actually a White-toothed Pygmy Shrew (Suncus etruscus), which happens to be the smallest mammal on the planet at about 3.5 cm in length and 2 grams in weight, although some give this title to the Bumblebee Bat (Craseonycteris thonglongyai). I remembered my cat Tiggy caught several of these shrews where I used to live in Costa del Silencio, and at the time I was hoping to make my name for discovering the rare Canary Shrew (Crocidura canariensis) far away from where it is said to live. I got in touch with Dr Aurelio Martin at La Laguna University about it but he confirmed it was only a White-toothed Pygmy Shrew. Still, I wasn't expecting to see one in the streets of La Orotava! If that wasn't a big enough surprise, just around the corner was another one. I almost couldn't believe my eyes when I saw a peacock strolling up the pavement alongside the parked cars. He looked at me as I looked at him and then decided to go into a rose garden at the side of the road where he started eating the shoots of grass poking through the soil. You see, I told you La Orotava was a special place - where else can you expect to see the world's tiniest mammal and a beautiful peacock walking on the cobbled streets? I don't actually know but the main one they make here is massive. People visit La Orotava just to see this! Is this unique to this place, to have floral carpets for the feast of Corpus Christi? Visiting the remote mountain villages of Tenerife's north are like taking a step back in time. Las Carboneras is one such hamlet.